2 cents music: "Chinese Scores"
A large amount of published scores of Chinese Music are in numerical notation. 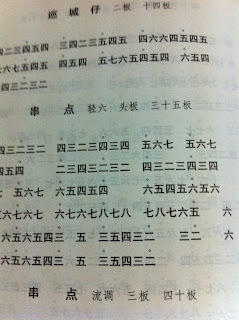 This form of notation however, did not originate from China. Most folk music in China had never been notated down before the twentieth century. Only music played by scholars and some court music are notated down. Folk songs, folk melodies are mainly orally transmitted. Some melodies may be written down, but these were only the skeletal notes and the method of notation varied widely too. Operatic music may only be known by their name or the qupai (曲牌) which are titles written for each section to let the musicians know what tunes to play. Below are a few non-exhaustive examples of the cipher notation. 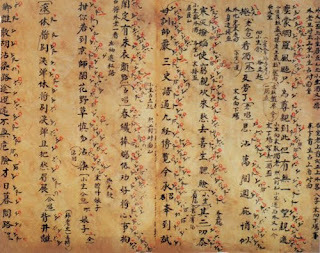 Score written in the gongche pu (工尺譜). Other forms of cipher notation, the er si pu (二四譜). Since the turn of the century, more and more Chinese gain increasing exposure to the outside world. The musicians among them also learnt and brought with them, modern methods for notating music. The numerical notation could perhaps be traced back to the Genevan philosopher Jean-Jacques Rousseau who later moved to France. In 1742, he presented to the Académie des Sciences a new system of using numbers to represent intervals between notes. This system never caught on in Europe, but found its way to Japan, and even later, via Chinese students in Japan, made its way into China. Unlike Western Art-music in which vertical harmonies are an integral part of the musical structure, the horizontal or linear aspect of the melody is of paramount importance in the structure of Chinese music. Because numerical notation shows the intervals between notes very clearly, sight-reading any melody becomes very accessible. This is perhaps the reason why numerical notation serves Chinese music very nicely while it never gained a foothold in Western classical music - it was easier to "feel" the chords with staff notation than with numbers. From the beginning of the twentieth century, more and more tunes started to be written down. Folk songs were transcribed. 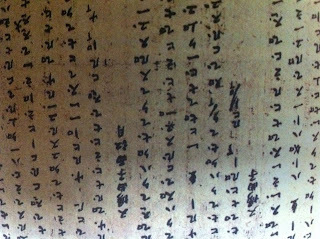 Scores written in various cipher notation were also re-written with numerical notation. As a result, a lot of music became accessible to the layperson. New music that were composed were also notated with the numerical notation. 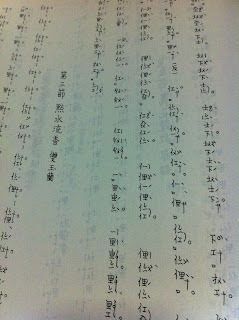 By the end of the twentieth century however, staff notation started to gain more popularity in Chinese music. Tonality in new Chinese music started to blur, frequent key changes, chromaticism and atonality became prevalent and numerical notation no longer provided ease in reading a score. Like any other aspects of music, musical notation evolves together with the times, the society and the people as well. In an era where only the scholars and the royalty were literate, music was not usually written down. As literacy increased, people sort ways to write down music to aid memory. The numerical notation, being most suited for the linear nature of Chinese music thus gained popularity. As music changed and numerical notation became inadequate for the new music, staff notation started to gain a foothold too. There is no single best way to notate music. Whether it's numerical or cipher or staff notation, the type of music dictates which form of notation is most suitable. And just like all other aspects of music, it is influenced by the society, the people who make the music. The numerical notation is actually largely parallel to the modern staff notation, the main type of notation in Western Art-music. The notes are represented by the numbers 1 2 3 4 5 6 7 which correspond to the degrees of the diatonic scale. Sharps and flats are written accordingly, next to the note, for example qf, wdand so on. 'b1atu1nmh1 z1g2L .`41 xr1styL1cx ub1brd1 br1aut1nbrs1nbratu1bnh1 1'1 b1gtuL1bn 1nbbh1nrbatu1bnrd1 br1stu1nbra1nbhn1bra1 1'1 1g1;2 ? Fig. 1 shows an example of the common things one finds in a score of numerical notation. At the very top of the score, the 1 = G refers to the pitch relation of the music. 1 = G means that the note 1 is G, 1 = D means 1 is the note D and so on. Take note that this only refers to the note 1 being the note G or D and so on, but does not automatically imply that the pitch centre of the music or that the most important note, or the tonic is G or D or whatever other note that is written there. At the beginning of the piece of music or a section, there may also be instructions written to let the performer have an idea of the tempo of the music, or the mood a particular section intends to depict. 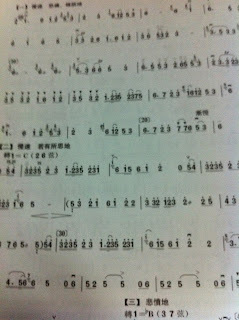 In this example, the tempo marking 中速 thus instructs the performer to play at a medium speed that is not too fast or too slow. With influence from Western Art-music, these performance instructions are often given in italian terms that is conventionally found in the modern staff notation as well. Before the start of the music, there is also the time signature, similar to that found in modern staff notation. In Fig.1, the time signature of this piece of music is in #!, denoting 2 crotchets to each bar. The rhythmic notation can also be easily extrapolated from the modern staff notation. A refers to a crotchet or a quarter note. xA a line below the note makes it a quaver or an eighth note. bA two lines below the note denotes a semiquaver or a sixteenth note, and so on. A; with a dash after the note, it means a the length of a crotchet plus another crotchet, hence a minim. A;; two dashes makes up a crotchet plus crotchet plus crotchet, the length of a dotted minim, and so on. Al xAccxl bAbnl dots after the notes similarly means a dotted note, here we have a dotted crotchet, a dotted quaver and a dotted semiquaver respectively. Finally, the repeat signs (,. ), the barlines ('?) and other signs are similar to those found in the modern staff notation as well. Ying You Qin. Zhong Wai Yue Qi Wen Hua Da Guan. "中外樂器文化大觀". Shanghai: Shanghai Educational Publishing House, 2008.